Larry Cantrell came to performing in opera by way of the back door opened by Gilbert and Sullivan. In 1959, just months before graduating from high school, he became an ardent fan of San Francisco's G&S performing company, The Lamplighters. By gradual, but inevitable steps at The Lamplighters' tiny performing space in downtown San Francisco, he took on the tasks of ushering, ticket-selling, pouring coffee, advertising, audience-building, running the light board, building and painting sets, negotiating with unions for musicians and stagehands, constructing costumes . . . and just about any other backstage or front-of-the house activity. 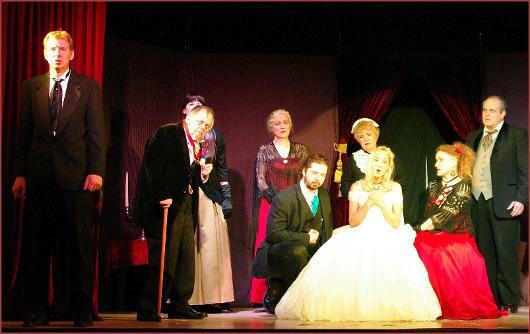 When it was later announced that The Lamplighters had acquired complete control of a fully equipped and functional 1260-seat ex-vaudeville theatre and that the existing cast would be expanded exponentially to fill the vastly bigger stage, he approached the musical director of the company with a tremulous request to audition for the chorus. She was kind (or stunned) enough to take him on, despite his ghastly, croaked rendition of the tenor aria, "Take a Pair of Sparkling Eyes," from "The Gondoliers." In short order, he found himself on stage as a citizen of a small Japanese town in "The Mikado," a sailor on the deck of H.M.S. Pinafore, a jilted Dragoon-Guard in "Patience, a highly-biased juror in "Trial by Jury," a pirate in Penzance and all the other assorted country bumpkins, peers-of-the-realm, medieval gentry, Tudor-era rabble, Venetian gondoliers and interfering ghosts inhabiting multiple productions of all the eleven G&S shows then considered worthy of production. Along the way, he became a voice student with June Wilkins, an excellent mezzo-soprano and prominent member of the San Francisco musical community. Not long after that, came small solo G&S roles: Antonio in "The Gondoliers, "Leonard Merrill and the First and Second Yeomen in "The Yeomen of the Guard," Cyril and Guron in "Princess Ida.". Eventually, he appeared in about 250 performances of the Gilbert and Sullivan comic operas-- including over 100 "Mikados." At San Francisco State University, while working for a degree in political science, Larry took courses in opera history and production. In the university's opera workshops and in the occasional mainstage production, he took on Tybalt in Gounod's "Romeo et Juliette," Filch in "The Beggar's Opera," Guillot in "Manon," and Le Remendado in "Carmen." Not long after moving to Canada, Larry began to experience the first signs of the rheumatoid arthritis that would eventually wear out the joints of his knees and hips, costing him long hours of blinding agony for every half hour for which he stood, and, far worse, convincing him that he would never again be able to sing before an audience. After more than twenty years, the arthritis "burned out," as it sometimes does in very rare cases, leaving behind the long-term damage it had done to his bone structure but allowing him much greater freedom of movement--and the reborn hope of performing again before the public. After retiring from work, Larry became aware of the recently created Opera Pro Cantanti, watched them perform "Rigoletto," "Norma" and "Lucia di Lammermoor" on three consecutive Sundays and decided that OPC was just the sort of thing he wanted in his life. Since then, he has gladly taken to the supporting tenor or "comprimario" roles in the OPCrepertory: Normanno and Arturo in "Lucia," Borsa in "Rigoletto," Sir Bruno Robertson in "I Puritani," Gaston and the Marquise in "La Traviata," Flavio in "Norma." The First Justice and Christiano in "Ballo in maschera" and Abdallo in "Nabucco." And with any luck at all, he intends to keep at it for years to come!